How do I log into Windows 8 automatically? I just received a new computer with Windows 8.1. When I boot it up, it asks me for a password. I am the ONLY user on this computer. It is mine and mine alone. I don't want to type in my password each time that I restart the computer. Is there some way to override this feature? This is a very common question. The answer's a bit buried, but it's actually quite simple. And for the most part, it applies not only to Windows 8, but Windows 7 and Vista as well. Continue Reading: How do I log into Windows 8 automatically? Wonder if a virtual machine will save XP or if you can avoid a Microsoft account? Having problems downloading files or getting old software? Want to know if the router the ISP gave you is safe? All that and more in this Answercast from Ask Leo! Is it safe to let websites remember me? Safety in your internet browsing depends on how secure you really need to be! So let's take a look at what remembering a login really means. Continue reading: Is it safe to let websites remember me? How do I get Office if I'm on dial-up? Software packages, more and more, are coming as large download files - I wouldn't even attempt to do it on dial-up! There may be a few options for you that will work. Continue reading: How do I get Office if I'm on dial-up? Is my ISP's router safe to use? There are a number of compelling reasons to use the router your ISP provides for you. Ongoing support is one. And switching to another router won't necessarily do anything to guard your data. Continue reading: Is my ISP's router safe to use? How do I reinstall software if I don't have the installation discs or download files? If you bought it you can, and should, save it. Even if it is just a downloaded installation .exe file and activation code. Continue reading: How do I reinstall software if I don't have the installation discs or download files? What does signing into my Microsoft Account really mean in Windows 8.1? Microsoft certainly does make things confusing. So first let's sort out the difference between logging into your Microsoft account and logging into your computer. Continue reading: What does signing into my Microsoft Account really mean in Windows 8.1? 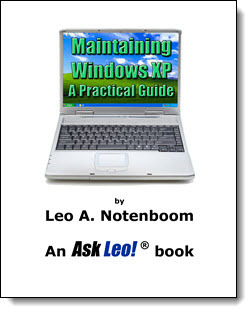 Continue reading: Can I isolate Windows XP in a virtual machine to stay safe? Why can't I get software on CDs or DVDs? Can malware authors hijack my anti-malware software? I have a dedicated XP machine only because I have two old but very useful items of software where the graphics refuse to run under any manifestation of XP within Win7. The latest versions of these are very expensive and changed so radically that I'd have to start again from square one rebuilding ten years of work. If I can isolate this pc from the internet but keep it connected to my home lan I'm assuming I'll be safe from malware. It's a dangerous assumption to make in an absolute sense. Malware can and has been known to "jump machines" - much like it can travel on USB drives. I'm not saying that yours is a bad option - it may be the only option - I'm simply pointing out that "assuming I'll be safe from malware" isn't really a good assumption. I couldn't upgrade my perfectly-good-but-old laptop 1GB laptop to Windows 8. I installed LinuxMint instead and it works great. Does everything I need it to do. Has an app store for easy software downloads. I experienced no driver issues at all. Linux has come a long, long way since you bought that XP computer. If you want to extend its life and enjoy a safe, secure, modern OS, I highly recommend checking out the free LinuxMint OS. I've been using the same passwords for over 30 years. I used it when I was working on mainframes and now use it on PCs. These days, I have 3 variations of it as well as 3 variations of another one I have used many years. Unless I get locked out for too many tries, I can usually eventually get on. Now, sites are getting more difficult, like having to use at least 8 characters, with at least 1 capital letter, at least 1 number and then at least 1 special character. Sometimes they will have an image and then on top of that some start asking stupid security questions The questions you can choose from are moronic. Many of them are useless to many people. Like what was your 1st pet's name. Who the heck remembers that and what if they never had a pet, then that question is out. Then there's family questions. Many people don't have family or very l;little of them. Cross out those questions. Your favorite car, what did you want to be, etc. I think they get morons to dream up those questions. I can throw out about 80% of them cause I can't remember or they don't pertain to me. And it's usually a site like my TV Listings or some blog that makes passwords the most difficult. I wish some of these jerks would use their noggin once in a while. Thanks for letting me vent. The solution to your frustration is simple. Make up answers - in fact treat them like passwords. Your favorite pet? Pencil. Or FTSC8w10GI3x. It doesn't have to be a pet. All that matters is that you answer it, and that you can provide the same answer in the future. Using fake answers is highly recommended additional level of security. Complex passwords - with numbers and special characters - those I agree with when passwords are short. Too many people select simple passwords that are easily cracked. This enforces at least a little bit of randomness. What I wish is that a) all sites were consistent, b) all sites allowed spaces, and c) all sites allowed passwords of up to 256 charaters or so. That way you could choose a lengthy pass phrase with no special characters that was every bit as secure and possibly easier to remember. Is Windows 8 a Disaster? Hi everyone, I'm Leo Notenboom for Ask Leo! I read someone calling Windows 8 a disaster the other day and to be completely honest, it just rubs me the wrong way. Windows 8, as an operating system, is not a disaster; it's a fine, fine operating system. Like I've said many times, I use it myself; I use it regularly. Continue Reading: Is Windows 8 a Disaster?